Welcome to Day #3 of Chocolate and Nuts Theme Week. Coconut, almond and chocolate blends have been staples in the chocolate candy bar world for decades. We grew up with Almond Joy* candy bars. Today's Coconut Salted Almond Coconut Bites from Theo Chocolate (Seattle, WA) might be considered an updated, dark chocolate version of that bar. 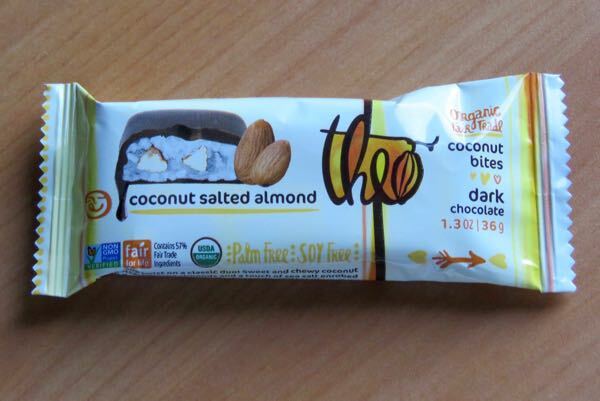 Made with organic and fair trade** ingredients, this palm free and soy free, 2-piece bar had a slightly chewy, sweet (Non-GMO corn syrup, cane sugar) shredded coconut filling, but the dark chocolate and almond bits (and a faint hint of salt) helped balance the sweetness. 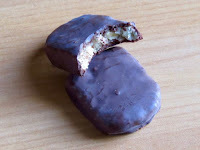 *The Almond Joy candy bar, packaged as two pieces had a coconut filling, topped with almonds and covered by milk chocolate. This bar was introduced after World War II (after ingredient shortages abated) by the Peter Paul Manufacturing Co., which later become part of Schweppes-Cadbury. And, skipping over some history here, the Almond Joy brand eventually became part of The Hershey Company.